Healthcare technology startup Practo has acquired NCR-based FithoWellness, a web and app-based fitness management platform for an undisclosed amount. "The acquisition will help Practo move into the preventive healthcare category," Practo's co-founder and Chief Executive Officer Shashank ND told PTI. 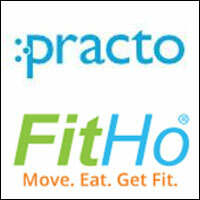 "Fitho will be merged entirely into Practo in the next six months and will become a single entity," he added. The Bengaluru-based startup has funded the deal from USD 30 million it had raised in February from Sequoia Capital and Matrix Partners. This was the second round of funding by the company, and the funds are being deployed "to finance growth and expansion plans," Shashank said. Fitho is an NCR-based fitness management web and mobile platform, started in 2010 by Dhruv Gupta and Prachi Gupta. Dhruv Gupta founded and exited two ventures successfully earlier -- the eyewear e-commerce and technology company GKB Online and social network Desimartini. He will now come aboard the Practo team. "Through the acquisition of Fitho, we now have a wider customer base and we are aiming to become a global healthcare services aggregator," Shashank added. In the next 12 to 18 months, Practo plans to expand to geographies such as South-East Asian countries as well as Latin America and parts of Middle-East and North Africa through acquisitions. "We are operational in Singapore and Philippines, besides India, and will soon start operations in Indonesia," he said. Practo is an eight-year-old company and started its online doctor search engine - Practo Search - two years back. At present, it is operational in 35 Indian cities. The firm also has a practice management platform for doctors called 'Practo Ray' that helps manage patients, billing and other services. "Practo Search has over 130,000 verified doctors listed and gets four million searches a month from 1.5 million users and is growing at over 30 per cent every quarter," he added.